Spark PlugsSpark plugs come in many different shapes and sizes. The information here relates to spark plugs manufactured by NGK which are suitable for Vespas and Lambrettas. There are two basic types used on classic Italian scooters. The main difference between the two types is the reach of the threaded section into the combustion chamber. The use of a long thread type plug in a short thread head may allow the plug to touch the piston head at top dead center which can cause serious damage. 1-9: Indicates temperature (1 Hottest - 9 coldest). 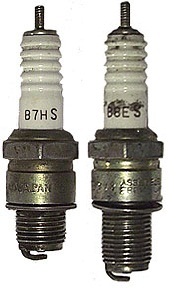 This type of plug is used on most older bikes before the Vespa Rally 180 and is NOT used on Lambrettas - but double check your plug type before fitting any plug. This type of plug is used on most newer bikes after the Vespa Rally 180 and all Lambrettas - but double check your plug type before fitting any plug.Full NGK plug codesBelow is a full list for anyone who might want to mess around with plugs for different applications. Click the mouse over a part of the example plug code to see the options and click again to close the window. 2 Stroke Oil Mixing CalculatorA two stroke engine lubricates the piston, crank, and flywheel side bearing separately from the gearbox and clutch lubrication system. This is done by mixing a 2-stroke oil in with the gasoline. Lambretta Series 1-3 Air FilterAn air filter's job is simply to ensure that the air entering the combustion chamber is clean. These are paper type filters and can only be cleaned with compressed air about every 3000 miles. Every 6000 miles or so, the air filter should be replaced. Air reaches the carburetor by a small air scoop under the seat just forward of the fuel flap. It travels down into an air filter box, through the filter, down a flexible rubber hose and into the carb. To remove the filter, remove the left side panel of the bike and loosen the clamp which secures the rubber intake hose to the carb (shown with a red arrow below). The filter can now be removed by unclipping the large spring retaining clip from the metal air intake (shown with green arrows to the left). The filter and intake will now pull out sideways from the air filter box. Sometimes the rubber gasket gets old and sticky and may need to be replaced (like it should be here). There is a wing nut on the inside face of the filter assembly which needs to be removed to change out the filter itself. Once this is done, the filter will slide off the central bolt and can be discarded. Check the flexible rubber hose for any cracks or breaks that might allow dirt into the clean air supply.Replace the filter and reverse the removal process to complete the job. Air filters work simply to make sure that the air entering the combustion chamber is clean. These filters are the metal wire gauze type and they really never wear out. Every 3000 miles or so the air filter should be removed and cleaned by soaking in new gasoline to remove any accumulated dirt. Large frame Vespas typically have the air filter either in the carb box mounted on the engine or, in older models it is mounted directly to the carb under the seat. Small frame Vespas have an air filter mounted to the carb which is accessed by removing the plastic glove box under the seat. It is removed by small wing nuts on the front side and can be cleaned by washing in clean gasoline. Access is through the under seat door. To the left are two filters which mount inside the carb box. Over the years the filters have changed so if you do have to change the filter, make sure you find the correct replacement. Above is a P200E (VSX1T) and a Vespa 150 (VBA1T) filter. Basically the air filter is a wire mesh which is either directly connected to the carburetor or housed in the air box. To gain access to the filter it is necessary to remove the right hand side engine cowl. Locate the air box which is at the end of a flexible rubber intake tube. Your model may vary but apart from small frames the set up below should look familiar.Remove the two philips head screws (arrowed) and remove the top of the air box. Be sure to leave the rubber sealing strip around the join in place, as well as the other assorted rubber grommets. The air filter on a P-series bike is held directly to the carb by two flat head slotted screws. Remove the filter and wash it in clean gasoline to remove any residue. Air filters don't really wear out as long as they are kept clean there should be no need for replacement.